It's morphin' time! 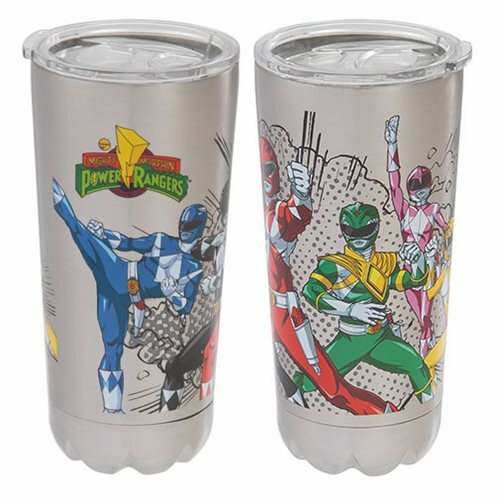 Take the Power Rangers wherever you go with this action-packed 7 1/2-inch tall Power Rangers 20 oz. Stainless Steel Vacuum Tumbler that shows the team in bright, bold wrap-around art. It features a double-walled design with vacuum insulation technology to provide a superior experience with your favorite beverages. You'll enjoy hot beverages that stay hot for over 4 hours and cold drinks that stay cold for about 40 hours! The BPA-free Tritan lid slides securely closed to reduce spills and can be used with a straw. The double-walled ergonomic design prevents condensation and fits in your hand, as well as your cup holder!